What do you get if you take six 7"s (three of which were released in 2005 and three of which are due to appear in March), take the A and B of each and then collate them on a single, user friendly piece of plastic? If you answered 'Stereolab - Fab Four Suture' than give yourself a star and go home early. If not; eyes open and read on! 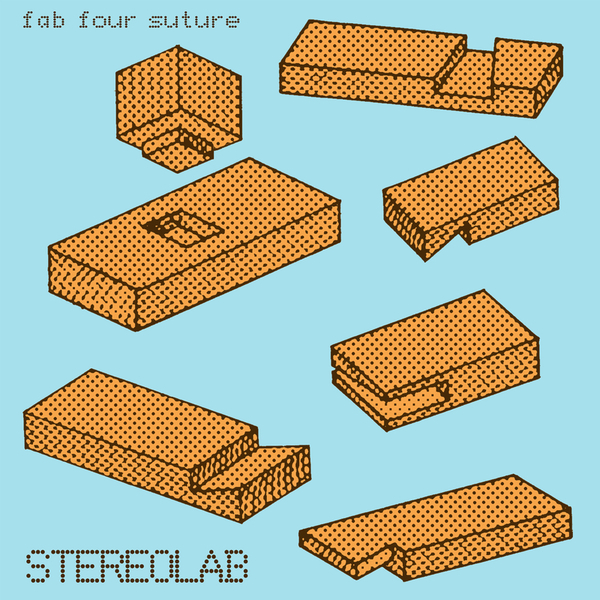 Whilst the harvesting of vinyl-only releases can often lead to an unsatisfactory full-length, the source material which was jacked for 'Fab Four Suture' benefits from being of the finest quality imaginable - with the newly invigorated Stereolab mining a rich seam of creativity that bodes very well for their many admirers. Opening with the Sunny-D vocals of 'Kyberneticka Babicka Pt.1', Stereolab remind you just what made them so compelling in the first place - tagging a beach full of choral goodness onto oscillating organs, rumtiddlyump drums and an almost lecherous undercurrent of unease (continued on 'Kyberneticka Babicka Pt. 2'). Elsewhere, both 'I Was Sunny Rainphase' and 'Platic Mile' are the kind of genreless Morricone-influenced Gaelic-pop that make you want to move to Paris, 'Excursions Into "Oh, A-Oh"' is Blondie reimagined in a toy-box, whilst 'Widow Weirdo' is about as concentrated a shot of Stereolab you could legally consume and still drive afterwards... Seven shades of fab!